ToniG wrote: I don't know Kenosha except for what I saw on election day, but for our lunch break my husband and I discovered a great local diner, the real authentic variety, that had wonderful homemade food (great soup) and fantastic pies, made by the owner's mom. It's called Andy's, located at 2301-63rd Street, phone 654-7770. It's been a family establishment for a long time, and they have a drive-in elsewhere in Kenosha. We were told that the best day to come for pies is Friday, when they have some 17 varieties available, including banana cream, coconut cream, rhubarb cream, and etc, and all the fruit pies you might want. We honestly thought it might be worth the drive up there to get some whole pies to take home, which you can do with a day's notice. Perhaps regular visitors to Kenosha know the place, but if any pie lovers are passing through, this is the place for you! 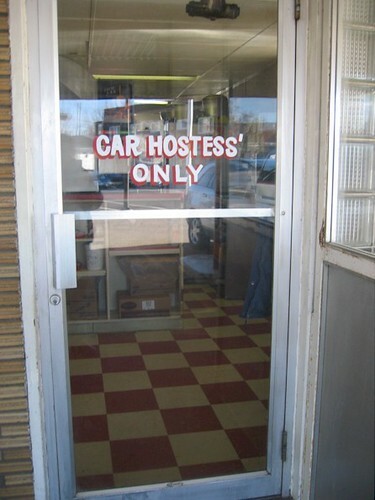 This place is not only a drive in with car hops, it also has a small diner inside. The menu on the building does not suggest the pies ToniG had, though the diner inside may. Imagination on the fly marketing! There is really quite a bit to like about Kenosha with Andy's yet another example. Last edited by Cathy2 on June 20th, 2007, 9:53 pm, edited 3 times in total. 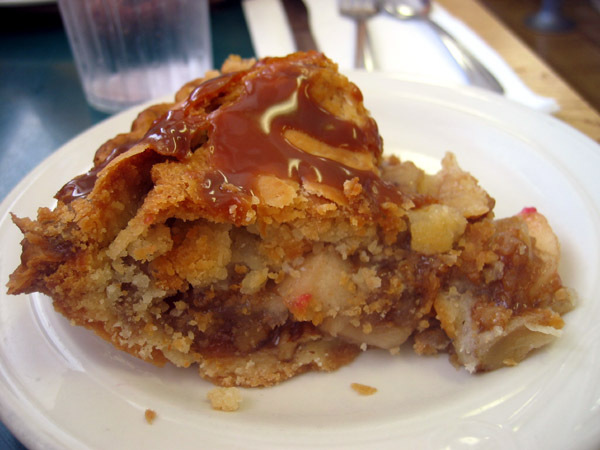 I thought it was about time to try the homemade pies available on Fridays at Andy's Diner in Kenosha. While I cannot usually make it on a Friday, I estimated there had to be some pie left on Saturday. Not quite sure where Andy's Diner was located, I stopped by Andy's Drive In for instructions. Less than 10 minutes later, I walked into Andy's Diner inquiring if they had any pie left. 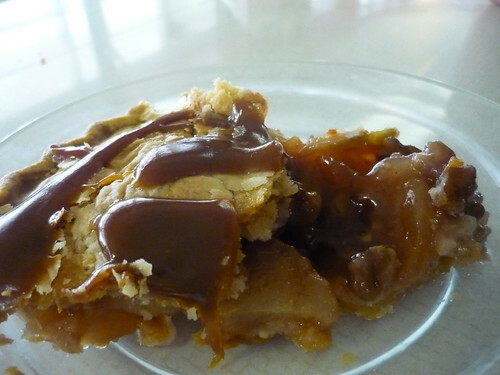 They advised they still had banana cream, coconut cream, cherry and one piece of apple caramel walnut pie. This piece was slightly smaller than my Mom's cherry pie, though it was full flavored and the nuts still had some crunch left to them. The crust was obviously flakey, though rolled out a little thicker than I prefer. My gave my Mom a sample, she was very disappointed there was no pie left after her taste because she wanted more. 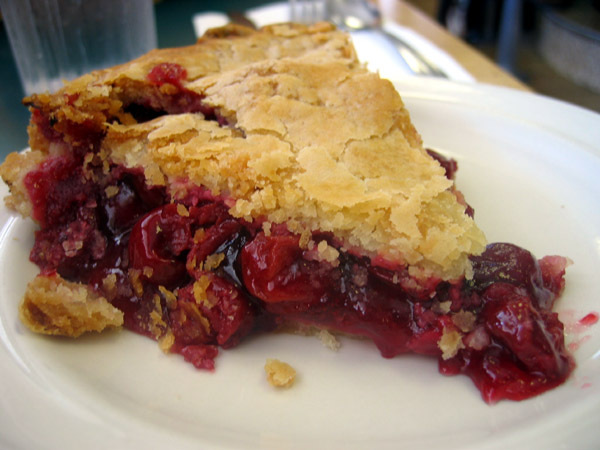 Mom had the cherry pie, which was pretty heavy with fruit. The density of fruit to filler seemed to indicate this was not canned cherry filling. I estimate they prepared the filling with frozen sour cherries. I did double check the ingredients to make sure I had both the roasted pork and the ham. Under the meat slices was mustard and a series of pickle slices arranges to assure you have one with every bite. 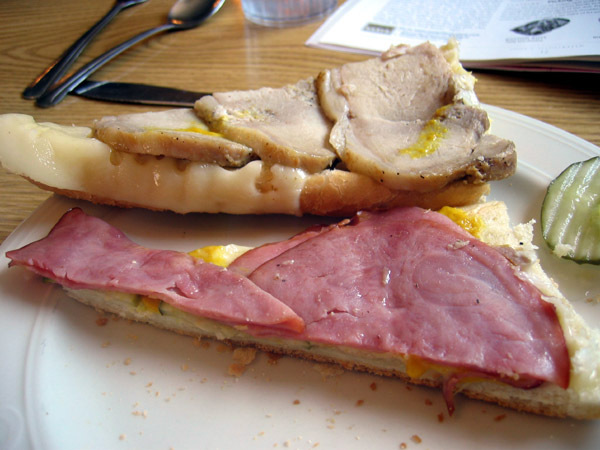 This sandwich was pressed to meld the ingredients, melt the cheese and toast the bread. Unlike my experience at Miramar in Highwood last year, where the Cuban Sandwich was really a glorified ham and cheese sandwich. 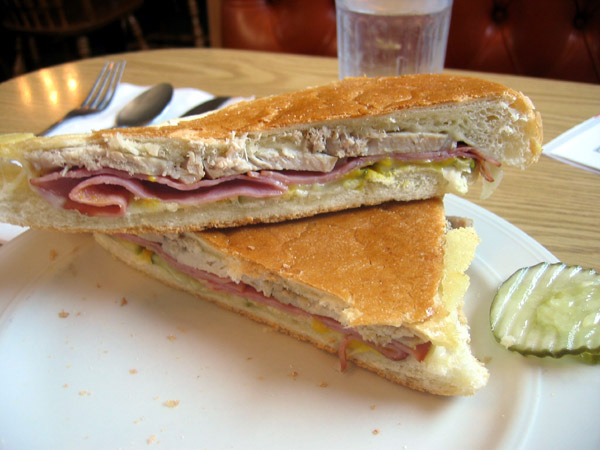 I think I finally enountered a genuine Cuban Sandwich just over the Wisconsin border. Andy's Drive In update: Classic Car night every Wednesday from 5:30 PM - 9 PM May-October. That's an expensive, slightly unorthodox (pork loin instead of pork leg, French bread) Cuban, but I'd have to say it looks like one of the very best examples hereabouts. It seems as if Andy's takes pains to be better than it probably needs to be. Even without the Cuban, Andy's looks like place to seek out. Thanks for the head's up. This is all good news because I heard a while back from a friend of mine who lives in Kenosha that Andy's Diner had either closed or been sold -- which was such a big deal in Kenosha that it made the local papers, so my friend said, though I neglected to insist that he send me the story, so I don't have all the details at hand. But obviously it's still open and turning out great pies, so that's great news. 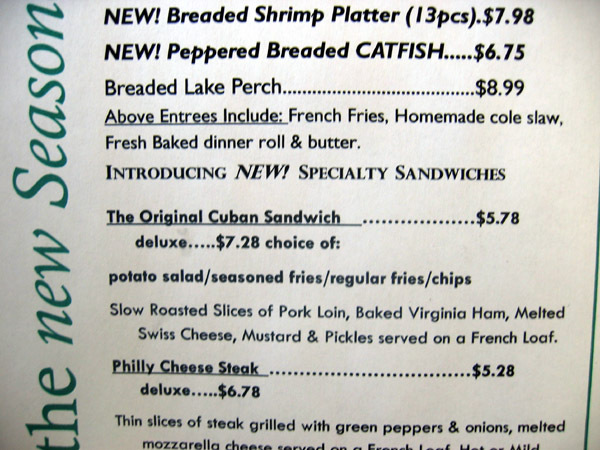 Maybe the Cuban sandwiches are indicative of new ownership, though. Was there any other evidence that someone new might be running the place? Whatever the circumstances, I'm glad to know that the place is still up and running. My occasional explorations of Kenosha during the last 18 months, I discovered there is quite the drive-in culture. 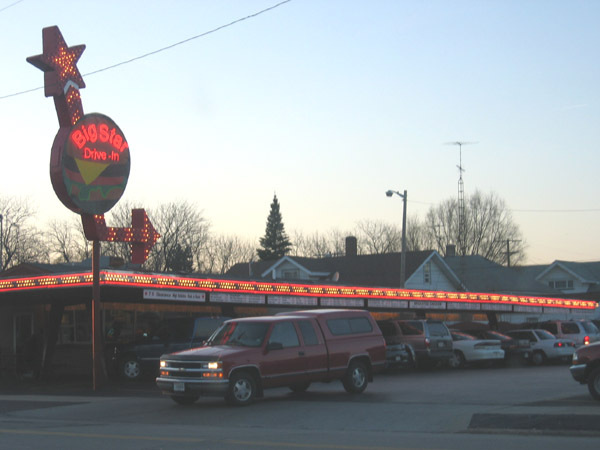 I know of at least four classic hamburger drive-ins in Kenosha. Not far from the Illinois border on Sheridan Road is an actual drive-in theater, if you desire for a drive-in themed excursion. Our first order of business was to order the broasted chicken dinner because they needed 20-30 minutes to produce. Lightly coated in a minimalist crust of flour, salt and pepper. The frymaster knew his business because from wing, to leg, to thigh and breast was each perfectly cooked. Our entire meal without tip was just under $13, which was very reasonable. There really is more to Kenosha than one may realize. The Big Star has been the Big Star since the early 60's. It's a family owned business that also owns Rooster's restaurant in Racine. Their signature cheeseburger is topped with real Cheeze Whiz and is quite tasty. Andy's Restaurant and Andy's Drive-In were both sold two years ago to Kenosha caterer. After the sale, Andy's wife continued to bake their pies. I haven't been back since 2005. 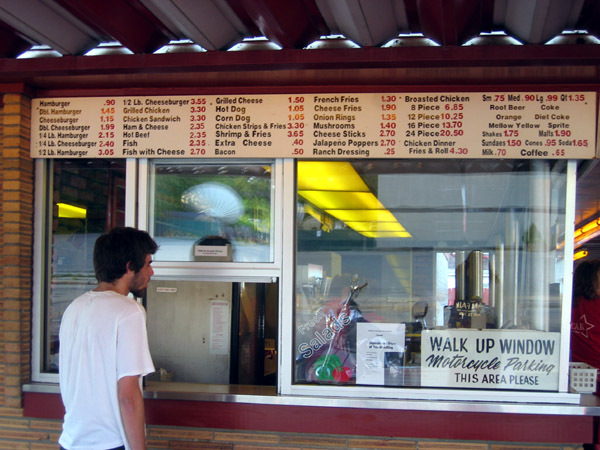 The Spot Drive-In has two locations in Kenosha, the original(circa 1946) on 75th & 22nd Ave and the second Spot(circa 1990) on Washington Road are two Kenosha burger joints that should not be missed. Their burgers, malts, and onion rings rate right up there with Kewpee's in Racine. 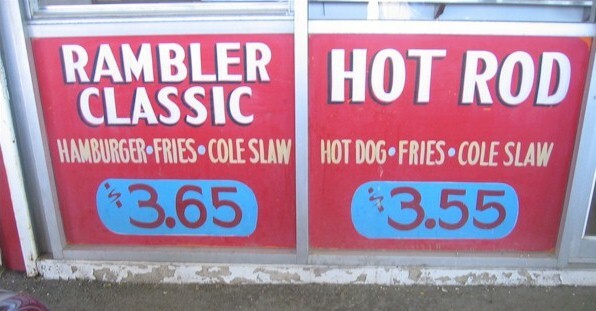 Baby Boomers swear the burgers at the original are better due to the age of the grill. 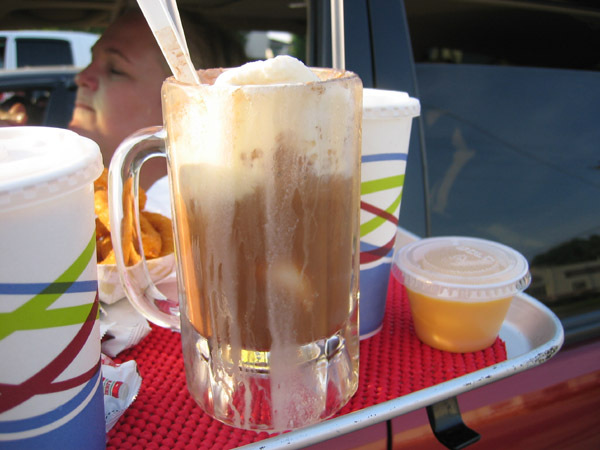 If you head north of Mitchell Field, east on Layton, don't miss the Nite Owl Drive-In for a gigantic burger and a malt. The Spot(s) was my next report. Andy's was a no brainer to locate if you follow Highway 50 East. I found The Spot when I missed the turn once and decided to continue on since I was going east anyway. I found the Big Star when trying to locate the other location of The Spot. Simply in visible traffic, Big Star seems to be the favorite. Josephine noted the prices at Big Star were much cheaper than The Spot. Andy's seems the most lack luster, it really needs some perking up. Cheez Whiz on the cheeseburger! I am pretty sure our burger was indeed a cheeseburger. The people of Kenosha are lucky to have so many choices. 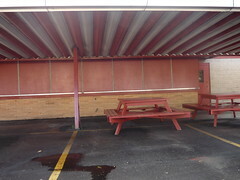 The northside Spot Drive-In closed on Saturday. 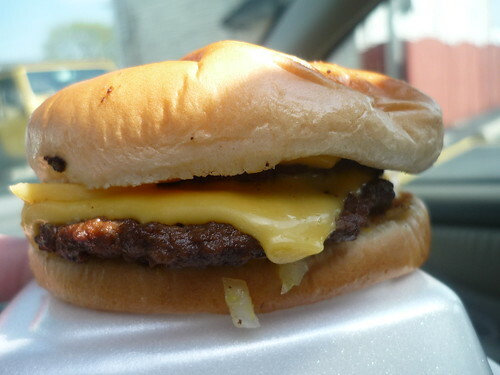 Fortunately, the original Spot Drive-In on 75th & 22nd is still serving the best greasy cheeseburger in town. If you eat a Spot burger in your car, the aroma lingers for at least a week. I spent the day driving from the fullerton entrance onto lakeshore drive all the way up to Kenosha/Racine. This is one of my all time favorite drives, its just another world out there and its so close to the city, I love all the motels/northwoods style bars, supper clubs and drive-in's along the route. Since I only had the day and wasnt able to make it to Kewpee's in Racine (closed when we got there) I developed a taste for a hamburger and wasnt going to settle on Culver's. 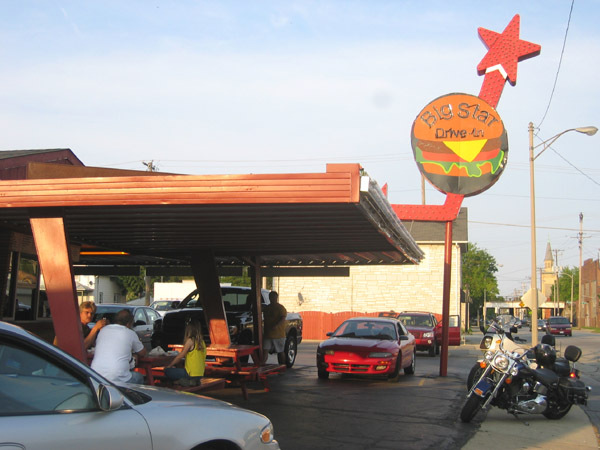 I was lucky enough to drive past Big Star which was packed with people around 7:30p. It looked like a cant miss so we pulled in to try some things, this was real old school drive-in that fit the description of one perfectly. I had a double cheeseburger ($2.10) served with real cheeze whiz and thought for the price it couldn't be beat and a corn dog ($1.10) again for the price it was just fine. The nice weather combined with cubs baseball with Pat & Ron along with the 30's style cheeseburger was a great way to spend my Sunday. Im a huge fan of Kenosha, theres just something about it that I love, and there were so many places that I had to try but just couldnt do it all in one day. For being so close to the city its a great weekend/day excursion and the waterfront public hangout is so relaxing on a nice spring day that by the end I was looking around for cheap summer rentals near the marina to spend my weekends at. Im going to be hanging in the IL/WI border Kenosha area alot this summer. Has anyone been to Ray Radigan's? It looked like a classic Wisconsin style supper club (restaurant in a house) I think ill have to try it when I do the circle tour this summer. Has somebody been to Ray Radigan's? Andy's Diner on 63rd is out of business. Radigan's, once a destination restaurant in the 50's, 60's, and 70's now caters to those born before the depression. Not recommended. The Coffee Pot is now serving an excellent Lithuanian breakfast which includes kugelis, bacon buns, and eggs. Food as good as my grandma and mother-in-law used to make. Much better than the Healthy Food Lithuanian Restaurant in Chicago. Call before you go. It's not on their daily menu. The new Bob Chinn's in Kenosha is still under construction in it's third year of development. Looking for Italian ice in Kenosha? Tenuta's Deli sells Lezza Italian ice and spumoni. Bring your cooler. Andrea's still serves the best chocolate malts and Patty melts in southeastern Wisconsin. The only Vienna Beef Polish and natural casing hot dogs in Kenosha are sold in front of the Stein Garden & Gift Store on Green Bay Road on designated Saturday's by interns of Hot Dog University. Kewpee's is and always will be closed on Sunday's. The Spot Drive-In is open seven days a week, with late hours on the weekend. An excellent thin crust pizza, just a slight notch under Zaffiro's, can be found at Mike & Angelo's in Racine on HWY 20. That's too bad about Andy's Diner. I had been thinking about going there soon for lunch. Does it mean Andy's Drive-In will sell the Mother's homemade pies on the weekend? I have had the Lithuanian breakfast at the Coffee Pot. Agreed it was pretty good, though I wish their bacon buns were as generous as those from Bridgeport Bakery in Chicago for a lot less money. I mentioned this in another thread. Someone told me of a bar in Racine (I am 90% it was Racine, otherwise it is Kenosha) where on Tues-Wed-Thurs nights they serve an Italian pasta (lasagna, spaghetti and mostaccioli, I think) from the kitchen. People walk in going directly to the kitchen for their pasta, then eat and pay at the bar. Does this ring a bell with you? If not, then I will have to go back to my source and write it down this time. I buy plants at Stein Gardens, so I keep my eye out for your students. "Someone told me of a bar in Racine (I am 90% it was Racine, otherwise it is Kenosha) where on Tues-Wed-Thurs nights they serve an Italian pasta (lasagna, spaghetti and mostaccioli, I think) from the kitchen. " That woudl be Totero's at 2343 Mead street. They have limited serving hours so call ahead. In fact I am not 100% sure they serve at dinner - only been there for lunch. Totero's is open Tuesday-Friday, 11:30-1:30. I've enjoyed their lasagna for many years, especially when Mama Totero was doing the cooking. If you finished one of her massive lasagna servings and she noticed your plate was empty, she'd bring another another helping, free of charge. The place is small and can't handle large groups. Bring your smoking jacket, because the bar and the restaurant are in the same room where smoking is allowed. I'll be selling hot dogs this Saturday with students from Hot Dog University at Stein's on Green Bay Road(HWY 31), 5 blocks north of HWY 50 in Kenosha from 10:30-2:30. Stop by if you're in the area. I dont know if it was just "closed for season" but it seemed like an odd day to be closed. Too bad, it was a neat little drive in with one gooey double cheeseburger I was feeling like eating at that moment. That is certainly a heart stopping image you posted. Meanwhile I poked around to learn Big Star is a March to September business, though you'd think it would be to the end of September. I recall being there early enough in the year to find the carhoppers in down jackets, which until now I assumed was a year-round enterprise. I also didn't find any news accounts lamenting the dear departure of the Big Star, which keeps me hopeful. I am sure ChicagoStyleDog will have the rock bottom information on this. Ya, it didnt seem like they had shut down forever but rather just nailed the boards up and closed for the season. I was just a little curious however because there were no signs announcing anything about see you next year and it seems like September would be a good month to stay open. Lots of business from kids when they get out of school and weather is perfect for a drive-in burger after the local H.S football game or whatever activities people of the town are up to on the weekends. Labor Day is always the last day of the season for Big Star. 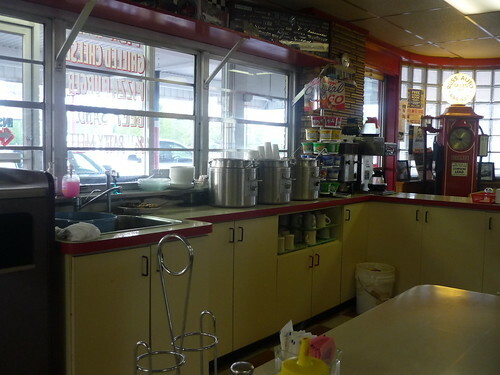 The family also owns a restaurant in Racine called Rooster's, patronized for breakfast and lunch by the locals. Big Star Drive-In was in full swing this past weekend. I stopped in for a double cheeseburger ($2.20) and pop while up there Sunday afternoon. 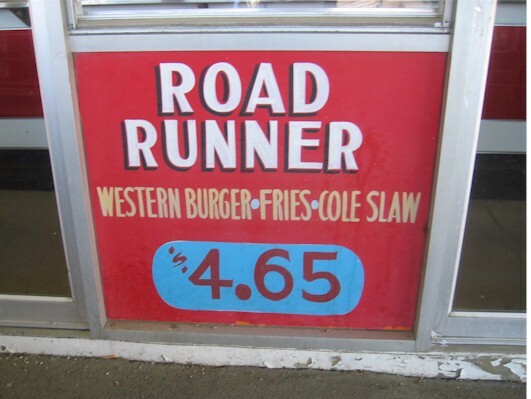 This has to be one of the best burgers your going to get any where for under $2.50. There wasn't a spot open on my second trip of the day (read on) and on both visits it was packed with families, groups of high school kids, bikers and everyone in between. It was really rocking. As mentioned upthread the filling of cheeze whiz takes it too another level. As I was waiting for my burger I was getting wiffs of a biker crews fried chicken and it was making me go crazy. All I could think about was fried chicken and I remembered reading from here that it was good. 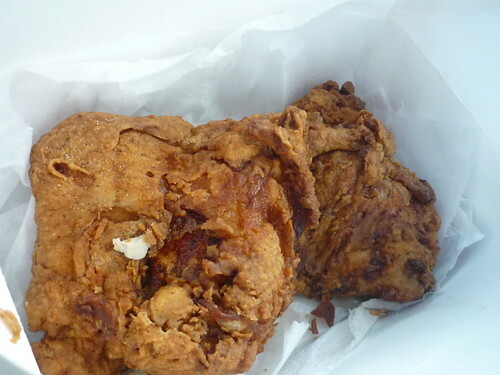 Even more insane is the price of this well sized perfectly fried chicken. You can get baskets with various amounts of pieces and its under a buck a piece. After making it over to Tenuta's in time I headed back for a chicken dinner. chicken dinner comes with perfectly fried piece of breast, thigh, leg and wing with an order of crinkle cut fries and a buttered roll and at $4.50 its got to be one of the best meals under $5 anywhere. No need to go too Subway down the road. Perfectly fried so it takes 20 minutes but its well worth it on a nice day to sit and wait. Even better when Chicago cubs baseball is on the air. 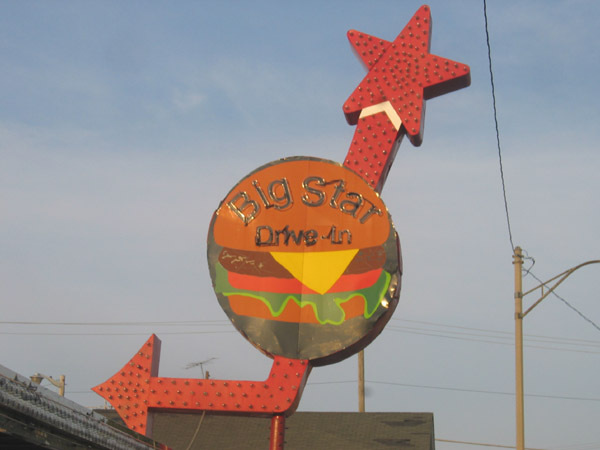 Big Star is on Washington Rd which is right off Sheridan ave along the lake Michigan circle tour. Big Star Drive In is a real treasure. The Drive In movie theater just down Sheridan is still open and currently showing Wolverine. I'm hoping that they will be showing Public Enemies this July. 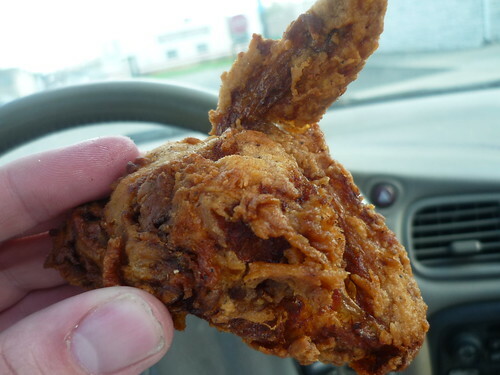 It seems like it would be a great movie to see at a Drive In theater with a box of chicken from big Star. 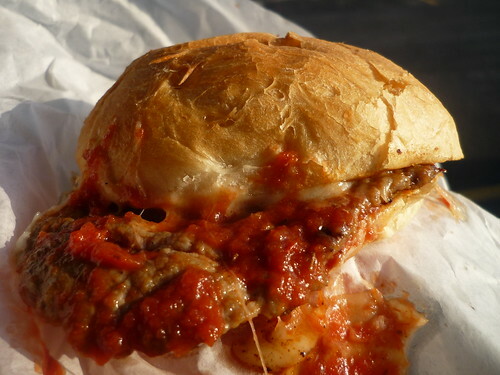 I enjoyed lunch today at Andy's Drive-In (in the course of an interstate beer run), and an interesting note about their pizza burger: the burger is actually an Italian sausage patty (no beef) with red sauce and mozzarella cheese on a hard roll, which was delicious. Kudos also to the mozzarella sticks, the perfectly-executed corn dog, and root beer (no ice) in a frosted glass. The fries were of the standard crinkle-cut variety but of ample portion. ogre wrote: Kudos also to the mozzarella sticks, the perfectly-executed corn dog, and root beer (no ice) in a frosted glass. The fries were of the standard crinkle-cut variety but of ample portion. Do they fresh dip their corn dog? 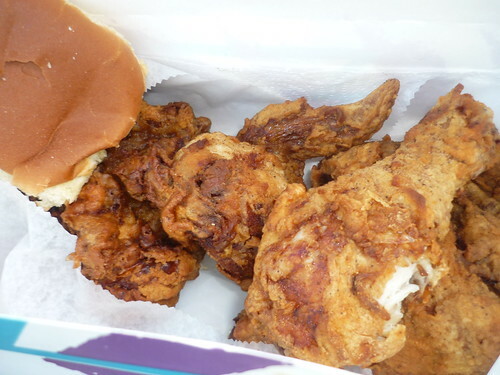 The Brat Stop, off of HWY 50, has the Best Broasted Chicken I have ever had. Their brats are fast and good it you want a fast 5 minute delivery, but the 15 min. 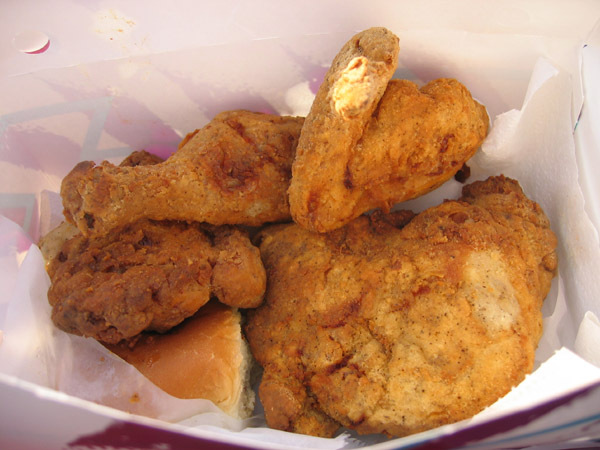 wait for the broasted chicken is so well worth the wait. gre-funny you should mention it but we are going to Kenosh for our 'interstate beer run' as hubby is a huge fan of Point Beer. We go to Tenuta's for the beer. Any good recs for other beer establishments? We will try and stop by Andy's but he loves Los Taquitos tacors el pastuer. Elfin wrote: gre-funny you should mention it but we are going to Kenosh for our 'interstate beer run' as hubby is a huge fan of Point Beer. We go to Tenuta's for the beer. Any good recs for other beer establishments? We will try and stop by Andy's but he loves Los Taquitos tacors el pastuer. Elfin, the Picky Eater is also a big fan of regional beer, being particularly fond of LaCrosse Lager which uses the original Old Style recipe. We've found that Woodman's has excellent prices and selection beer-wise (everything wise, really, it's a crazy store) and always make a stop. I finally made it to Andy's (discussed upthread) a while back and had to try the item many have talked about, the pizza burger. I guess its a pretty popular item around the Kenosha/Racine area as you can see from this post here by Rene G.
I went with a root beer float, coney dog, a piece of the pie (I forgot what kind it was, maybe apple caramel) and of course, a pizza burger. The burger and pie were both great as was the float. Like mentioned upthread its an Italian sausage patty with some pretty sweet red sauce and lots of melted cheese, the only thing that would of made it better would be some hot peppers. If cruising by I would and will for sure stop in again for a pizza burger and slice of pie. Just another great Drive In in Kenosha. Well technically not in Kenosha my last one too visit is the Park-in Drive In in neighboring town Racine. For a while, Andy's Drive In had a diner nearby called Andy's Diner, which I reported here. Andy's Mom is supposed to be the source of the pies. Unfortunately it has closed. At the Diner, they had Cuban sandwiches. Did you see anything like that at Andy's Drive In? 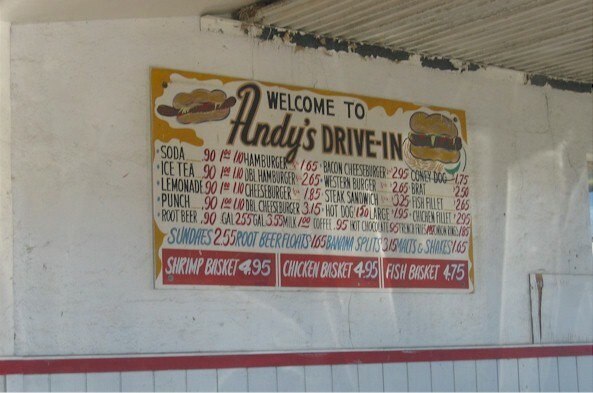 Andy's Drive In would really perk up with a new color scheme. That red cedar color does nothing for it. From running around Kenosha, I have come to appreciate why they have so many drive-ins and we have so few: cost of real estate and related taxes. Hey Cathy, ya this place was always on my radar due to your OP. I had known about the pie and diners closing through this thread and remembered the Cuban sandwich but I didn't see it on the menu. I agree greatly about the looks of it and a little color splash or neon sign really is needed. It just doesn't do it for the eyes like Big Star does. I will be having Big Star for dinner tonight, only 9 days left until they close for the season. 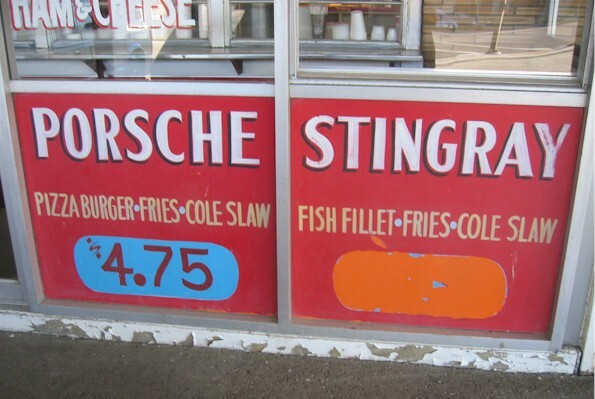 I think I will order the fish fry, burger, and tall root beer. We were at Big Star yesterday. The special was a second double cheeseburger for $1. I passed on the special and went with one double cheeseburger with a medium mug of root beer and some fries. Two double cheeseburgers sounded a bit excessive to me, even if it only was a dollar. The car hop came with the food and I realized that the double cheeseburger had disappeared in a disturbingly few pleasant bites. 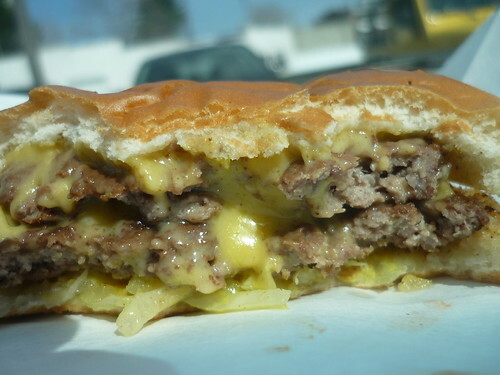 Someone upthread described this burger as gooey. Yes, in a very good way. It seems to be a steamed burger with a standard soft bun which may have seen some steam as well, with cheese whiz and well grilled onions. 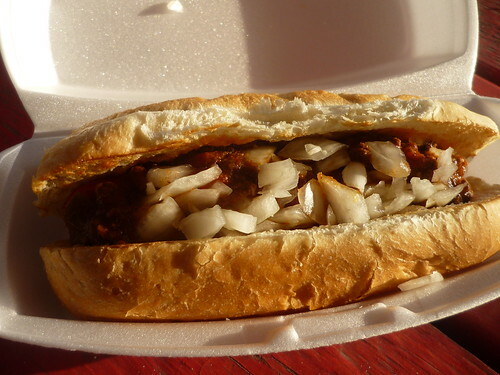 It is beefy, oniony, cheesy softness and goes great with their root beer. I called the car hop over and told her I would gladly pay her one dollar for the previously offered second double cheeseburger. Happily, Big Star obliged. 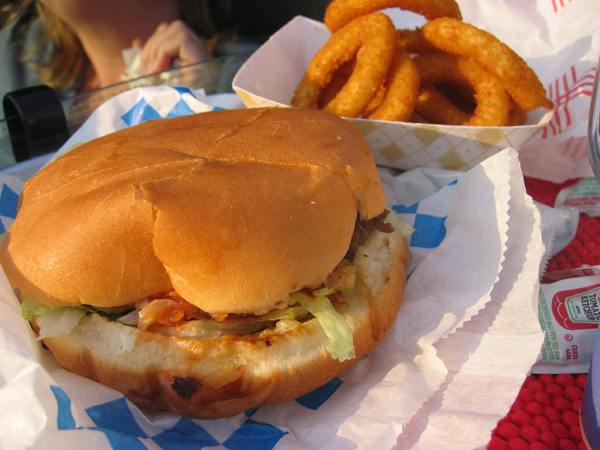 It was a perfect summer day for a drive-in hamburger (or two).